1/27: Welcome to Corinth, a 3 bed/2 bath condo in Windsor Hills. Property Size 1,410 sq. ft.
We are proud to be recognized as a PREMIER PARTNER of Homeaway and it is our pleasure to offer our 3 bedroom / 2 bathroom Windsor Hills condo, Corinth for your consideration. Vacation in style with our wonderful condo in the highly sought after resort of Windsor Hills. We have a great selection of privately owned condos and townhouses available here, each designed with your vacation enjoyment in mind, and 'Corinth' is a great example of that. Competitively priced, this beautiful home offers fantastic value for money providing, as it does, tremendous resort style amenities, in a secure gated community. 'Corinth' and is a 3 bedroom /2 bathroom condo in block number 4 of Windsor Hills. It is a fourth floor unit, serviced by the 2 elevators, and located less than a one minute walk from the main clubhouse/pool area, and as you would expect, this very popular condo also comes extremely well equipped. Corinth is a little different to other condos in that it has very rich colors throughout and an emphasis on themed rooms. The number of guests who return to this unit year after year tells its own story. Each room has a color and theme which only adds to the glamor of this very sought-after property. It sleeps 6-8 people comfortably, but we do restrict occupancy to 6 to preserve the condition of the home. The bedrooms consist of 2 Masters both with King size beds and full en-suite facilities, and a twin room specially themed for children. Corinth also boasts a full kitchen, spacious living room and dining area, and a laundry room with a full size washer and dryer. 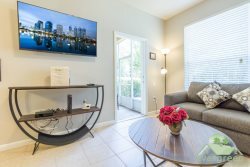 The main living area features a 50+ inch flat screen smart television, with a Blu-ray player, a DVR, and an upgraded cable package. Each bedroom is equipped with a flat screen TV for your enjoyment. Please note that the home also has high speed wireless internet access as well, which is offered complimentary to all our guests. The kitchen is fully equipped too with a dishwasher, microwave, full refrigerator, stove, coffee machine, toaster, waste disposal and all the hand held appliances you would expect. The house telephone allows free calls to the USA and Canada. All linens and towels are supplied for your stay in all our homes, with all kitchen utensils and crockery provided too. A patio door from the living area leads onto a balcony furnished with a table and chairs, and facing West, you can enjoy the setting sun in the late afternoon from here. Pictures of the Windsor Hills resort are mixed in with those of Corinth just to emphasize the real quality this community offers. As a company we are active in only the very best resorts, and Corinth is typical of not only the quality of homes we offer but the standards that we look to maintain. We hope you like it, thank you for viewing, and look forward to welcoming you on your next vacation!. This is Windsor Hills, perhaps the best resort in the Disney area, with top class amenities, and a resort that is firmly established as THE place to vacation for families of all sizes. It is widely considered to be a premier resort and once you have stayed there you will see why! 24 hour security, a very active clubhouse with a games room, workout room, small electronics arcade, several play areas, convenience store with good selection of food and drinks, and a large community pool are just a few of the reasons that Windsor Hills is so highly rated. The main pool is complemented by a water slide area, ideal for children of all ages. You can enjoy this and relax by the pool while your children are having fun enjoying multiple water slides. With a basketball court, tennis courts, small putting area, and even a business center for those who have to work as well, this resort provides everything you could need. Universal Studios-Orlando is about 25 minutes away, and Sea World about 20 minutes, traffic permitting. Kennedy Space Center is just over 75 minutes away, and in the other direction the beautiful Clearwater Beach area is about a 90 minute drive. There is a shuttle service available from here to all the major attractions and airports, though charges do apply. For golfers there are several courses within easy reach of here too, including The Legends course at Orange Lake, just a 5 minute drive from this excellent community, and the beautiful course at Celebration, only 15 minutes away. There are plenty of dining and shopping options nearby too, and for groceries there is a Super Walmart store just half a mile away.